I have been considering for some time a kayak build to go into class 3. I am trying to get a good idea of the boat and all the pieces to build it before I start purchasing to avoid any huge unknowns. I am trying have a build that is very fast to paddle when it is calm but also very fun to sail if there is wind. I currently have a Hobie AI which I love to sail when the wind is with me, but I don't enjoy it sailing against the wind or if I am going against a strong current. Plus I enjoy paddling more than the pedaling a lot of the time. I would like to have a boat that I can sail effectively, but also be able to paddle if conditions warrant. I am a pretty good kayak paddler so I have been looking at kayaks over canoes. I have been looking at purchasing a Stellar 18R kayak and putting one of the BSD sails, possible the 36', and one of their Boss systems on it. I feel that I would be able to sail nicely and also stow the sail and amas and paddle when necessary. My biggest concern after reading several threads on it is the BSD amas. I am worried about them submerging and slowing the boat down as other tribers have experienced. I was looking for a better alternative such as the Classic 16 inflatable amas on the watertribe site, but I was wondering if those would be compatable with a kayak. I have only seen them on the expedition canoes such as the Kruger. Does anyone have any experience with these amas on a kayak and how they perform? Also wether the amas would be stowable inside the kayak where space is more limited than in a Kruger, or would they have to be lased to the deck? Any thoughts on the build would also be aprreciated. Thanks in advance. Class 3 is an interesting class to enter. It presents a design challenge for the paddler/sailor. IMO, the basic premise is to take a canoe or kayak and optimize its sailing capabilities by having an unlimited amount of sail, a leeboard and if needed amas. When done right you will get a paddle craft that will sail well on all points of sail. When close hauled or in light winds, paddling and sailing at the same time can be effective. The challenge becomes what to do when there is no wind or when you need to go strait into the wind. One reason for going into the wind is that your velocity made good (VMG) is faster paddling that trying to tack up wind. When this is the case you need to have a rig that does not create a lot of windage or you can stow easily. I have not set up a kayak for Class 3 but I have experience with solo and tandem canoes. I also have two sets of the large WaterTribe amas. IMO, the BSD rigs are great "off the shelf" setups if you are not trying to go to fast and you can avoid sailing overpowered. The 36 sq/ft is a lot of sail. If you sail within the equipment and your limits it will get you to the finish of any WaterTribe challenge. They provide minimal windage when you have to go up wind. If you are going to go up wind for a long period of time then the whole rig will come off and stow in most boats. The WaterTribe amas are great for down wind and reaching runs. You can get some fun speeds going. But, IMO, there they have too much windage to paddle upwind. They also take time to setup and tear down. They are big. I don't think you will be able to stow the WaterTribe amas in a sea kayak and have room for required gear which would mean that you are not class legal. I am currently entered in Class 3 for the 2018 EC but I am waffling between Class 1 and Class 3. In 2016 I did the UFC in Class 1 and tried to optimize my sailing opportunities. Choosing Class 1 was the right call because there was a lot of times where there was no wind or headwinds. A Class 3 rig would have hurt me more than it would have helped. (SOS who did the UFC in Class 3 did great but his was purpose built boat with custom everything. He was fast enough to stay ahead of the tougher conditions I experienced. Check out his blog for more info.) I was very happy with the speeds I could reach with my FEKS 1 meter sail but there was times in the 2016 UFC where I wished I had better upwind performance. That has me now considering a Kayaksailor rig. It might just be the best compromise for those of use who don't have the resources to build custom boats. I believe someone did use the Kayaksailor rig in the NCC already and did great. One last comment, (taken from here). Building Class 3 rig is not just about being fast or being convenient. It needs to be safe. The right amount of safety considerations is different for everyone. The more athletic you are the more you might emphasize speed over safety but you need to make sure that the boat is sound and your Class 3 rig will get you through as many anticipated problems you reasonably anticipate. Ones that have happened to others include; punctured and leaking amas, broken akas, capsizes, water leaks in the hull, broken rudders, groundings, oysters, tangled lines, and hypothermia. For Class 3 using a kayak, I am partial to the BSD rig. Everything can stow inside your kayak. If you have another system that requires some components to be stored on deck, you rig might be judged as not seaworthy. Reef early and reef often and you can avoid burying the amas (most of the time). Having said that, although all of the BSD components can easily be stowed in most cruising/camping kayaks, I would leave the tubes that cross over the front deck in place when the rest of the rig is stowed just for convenience and a faster setup when you can get back to sailing. The Kayaksailor rig that MicroTom mentioned looks nice, but be careful. Since the sails are all more than 1 square meter and there are no amas (at least I didn't see any), this rig would put you into class 4 --- not class 3. Also, I am not a fan of trying to sail upwind in a kayak without amas. I might be persuaded to keep this setup in class 3, but it would take some work. Instead, if you want to avoid amas and akas, find a good downwind rig with no more than 1 square meter. Reefing is not required but can be useful. Make sure you can raise or lower the sail easily. Chief, Thanks for chiming in and helping with better guidance. I don't think it is better guidance. Just a different perspective. Thanks MicroTom and Chief for your replies! In the time that the forum was down I did purchase a Stellar 18R. I got to paddle one and loved it. Just FYI, and it is no longer a hypothetical. It is on the way from the factory. MicroTom, I appreciate your thoughts regarding the WT amas. I was concerned about their ability to be stowed in a sea kayak. I thought they would provide great stability, but in order to make it in to class 3 you have to be able to stow them, which would be a plus for a BSD setup. Since you have paddle sailed with both the FEKS 1 meter sail and also a larger BSD rig, I was wondering if you could give me a better idea of downwind and reaching performance of both compared to each other? I agree with what you said about your VMG being better just paddling into the wind. I am wondering how much you gain in terms of speedwith a BSD setup over just a 1 meter. That would save me a lot of hassle like Chief said going into class 1. Over the past month I have looked at both the FEKS and also the Falcon sails a little closer. I am actually leaning more and more towards going with just a 1 meter setup in class one. If the BSD doesn't really improve your speed upwind is it worth the difference when you are going downwind or reaching? Chief: I have looked into the Kayaksailor setup but don't really like the look of it. I don't like not having access to my front hatch restricted. It also just doesn't appear sturdy enough. If I were to go with a slightly larger sail without amas I think I would go with the Falcon Sails 1.3 meter sail. If I had more sail than that I would definetly want amas and would go with a BSD setup. Hi SlackLiner, I'm glad to see you considering class 3. It is a lot of fun. One thing to consider is building a boat versus modifying an existing hull. Even when you start with a good hull, there is plenty to do to customize it and prepare for an EC. Some people enjoy building boats, but if you just want to get out on the water, starting with a good hull can save a lot of time and get you closer to success. BSD rigs are not perfect for sailing, but many have logged thousands of miles in them in EC and UF, so they are proven in class 3. When I started out on this forum, considering doing the EC in Kruger Cruiser with class 3 sailing rig with big sail and amas, Whitecaps asked why I would want to turn an efficient paddling boat into a sailboat. That was good advise. Much of the time there will be no wind or contrary winds, and in that case it is better to stow the rig and paddle. Having said that, SOS did some impressive upwind sailing in his class 3 rig in the last UF, and that is something worth studying. SlackLiner. A few ECs ago I made an old 18' Necky into a class 3 boat by adding Hobie sidekick amas, a 2 meter Hobie Mirage sail at center, a PAS sail forward, and a leeboard. In hindsight the Hobie sail was too big. It tended to overpower the boat, and added too much windage when paddling upwind. But the rest worked quite well and I did make it to the finish. I could not sail into the wind with any efficiency, but on a reach or downwind it did great. I found the Hobie Sidekicks to be the perfect size. They provided enough stability to allow decent sailing, but were easily removed and stow-able. I intend to use this boat again in a future EC. The only changes I will make will be to replace the Mirage and PAS sails with Falcon sails, which are more efficient and manageable. I can email you pictures if you like. Since you have paddle sailed with both the FEKS 1 meter sail and also a larger BSD rig, I was wondering if you could give me a better idea of downwind and reaching performance of both compared to each other? The BSD will have better performance both downwind and especially reaching. The BSD is simply a bigger sail so it will be faster downwind. In a 15 knot breeze my expedition canoe with the FEKS does on average 3-4 and maxes at 6 for the most part. The BSD will do 5-8 and easily start surfing waves. Surfing waves can get dangerous and you risk breaking equipment. The BSD has the leeboard so it reaches very well. The FEKS requires paddling at the same time and you will crab sideways especially if you don't have hard chines. Any Class 3 rig is going to be much faster overall in favorable conditions. If you look at the finishing results for good years when 70%-80% of entrants finish you will see the Class 3 boats can come in a couple days ahead of the Class 1 boats. If conditions are not favorable and everyone is battling headwinds Class 1 and Class 3 post similar times. I am actually leaning more and more towards going with just a 1 meter setup in class one. A very common discussion between Tribers is to sail or paddle. I like to boil it down to a personal preference question. Are you paddler first and a sailor second or are you a sailor first and a paddler second? That usually dictates which way you go and what will make you most happy regardless of how fast you finish. Final comment. This all opinion. Ask two different people and you are likely to get two different answers. So use your own best jugdement and don't be afraid to go out and experiement. Learning from your own experiences is the best way to have fun and find out what works best for you. Good input from all on this subject. MicroTom sent me an email and pointed out something in the rules for Class 3 which is as follows. Sometimes I need to read my own rules :) That means that my earlier comments about putting the Kayaksailor rig in class 4 is wrong. It would go in class 3. Outriggers are allowed, they are not required. The Stellar 18R looks like a great kayak. It should do you well in either Class 1 or Class 3. Thanks everyone for the replies!! I appreciate all the help. I am hoping that the kayak will arrive in the next couple of weeks. I am waiting to hear from the dealer on when exactly it will get here. I am excited for it to get here and I can begin taking a better look at how I will rig it. One of the reasons I went with the 18R is that it has a surfski style footbrace inside the cockpit instead of the pegs on the side giving you the paddler more forward drive with your legs. One of concerns I do have with the BSD rig is that the mast goes through the hull and is secured right where the footbrace is, so if I went that route I would have to find a different place to attach the mast. I am going to see if I can maybe mount it in the forward hatch just behind the opening. Oh the possibilities! WindwardMark: I hope to one day build my own boat but right now I don't really have the time. I think if you go that route it opens some more oportunities for you for sure. I have watched the videos of SOS in the UF and read his blog on the boat he built. Seeing how well he did in that boat was part of the inspiration to go into class 3. You said, "why would you want to turn an effective paddle boat into a sailboat?" I would be concerned about that as well. Whatever I choose to do, I don't want to dampen the abilities of the boat to be paddled, that goes to what MicroTom was saying about are you a paddler or sailor first. I think I lean toward being a paddler first and sailor second, I just want to be able to sail effectively when the opportuinity arrises. Clewless: That sounds like an interesting build. I would love to see your pictures. I am curious about your experience with the Hobie sail overpowering the kayak. Which Hobie sail were you using? I have also considered going with two 1 meter sails as you mentioned. Do you anticipate that the boat will preform better with two smaller sails? MircoTom: Thanks for sharing your experiences with both setups. You mentioned how with the BSD you started to surf waves and began risking breaking equipment. One of the concerns I have is that my kayak is much lighter than your Kruger with less drag, it will pick up speed much easier. 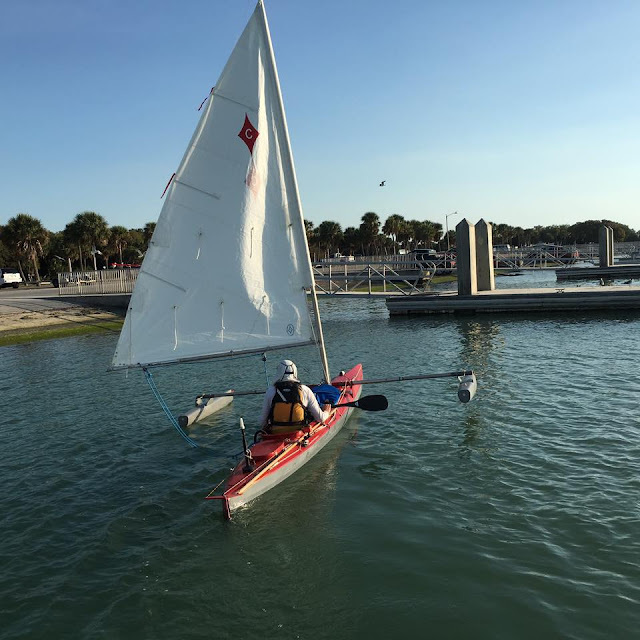 The 36' sail I mentioned earlier was one that was an option offered to me by BSD, but I would be concerned that sail is too powerful for my kayak, even with the reefs, especially in rough conditions. It might be wiser to get a smaller sail. I think I will know more once I get some time in the boat once it arrives. I look forward to experimenting with it like you said. It seems like half the fun is brainstorming new and better ways to do things that suit your own style. I might just start really simple and then go bigger if I choose. Thanks again everyone! I'll try to post some pics of the kayak up once it arrives. Now having said all the above. I really like the looks of the KayakSailor rig: the ability to reef, the double leeboards, the genoa option. Finally I get to the point - I actually do have a question: Does anyone have experience or know of anyone using the Kayaksailor in an EC or UF event?